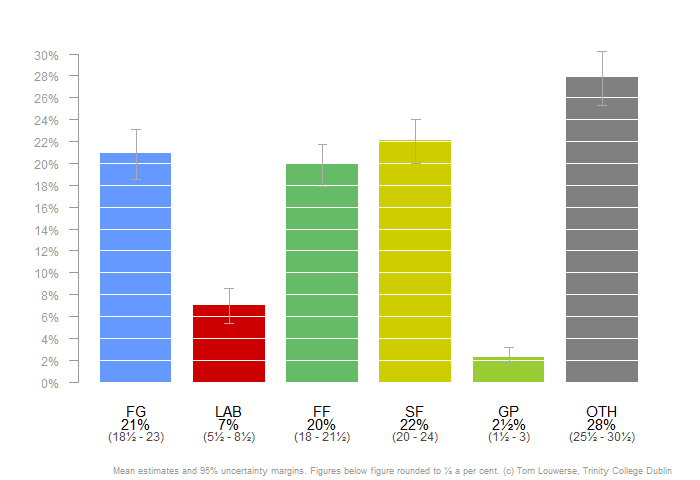 Independents and others are back on top of the Irish Polling Indicator, which combines all Irish opinion polls to one estimate of current party strength. They are now on 28%, with an uncertainty margin of +/- 2.5%. Fine Gael has been loosing support since early September and is now on 21%, with Sinn Féin on 22% and Fianna Faíl on 20%. The differences between these parties are so small that we cannot definitely say which one is currently the largest of the three.